A few months back.....I told you about this Fisher Price Rock and Play Sleeper. My friend, Alissa, told me about this product.....and after getting one for ourselves.....I loved it, as well. So I wanted to share about it then.....so that others could enjoy the same! 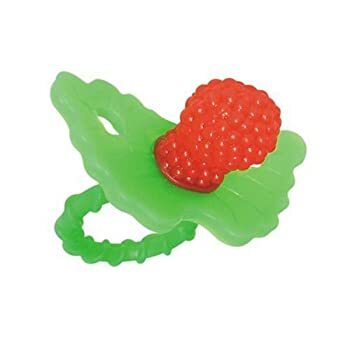 My friend, Heather, told me about the RaZberry Teether. I had told her how Grace is not really interested in the pacifier....but that I thought she was starting to teeth. She then told me about this! I love it.....and more importantly....Grace loves it! It has the 'ridges' and 'bumpiness' all around it. The whole thing is made out of the same material.....it's not too soft.....and not too hard......and the handle is so skinny and small....perfect for her little hands. She chews on the entire thing! And it comes in several different colors. I have seen these at Babies R Us (in the store, but not online)......and Amazon.....and I am sure they can be found in many other places.....but these are the places I have seen them for sure! Thanks, Heather, for letting me know about such a great find! Since then.....things with Parker have gotten much better. 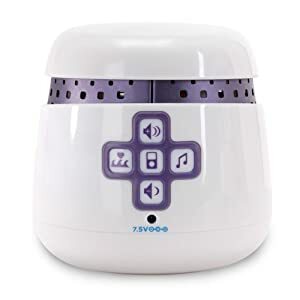 Anyway.....I think it may have been about a month ago....Kelly (from Kelly's Korner blog)....posted about how she purchased this sound machine and that it made all the difference in her daughter sleeping through the night. I immediately went to check it out! After some research....and a suggestion from a blogging friend, Kat.....I decided to go with this one. I am not saying which sound machine is better. I can only attest to the one I bought.....and I love it!!! Last night she woke up at 5am......did a little whining.....but not enough for me to go in and get her. And she went back to sleep until 7:15 (after going to bed at 6:30 the night before!). Also- the napping is getting......better. 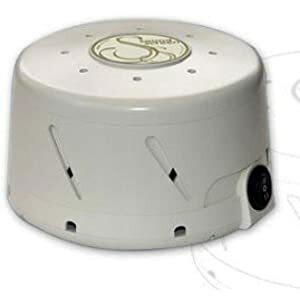 Now......with all of that being said.......I really do not know for sure if this sound machine is the reason she is sleeping better. Maybe she is just getting older and able to sleep longer stretches? Maybe her teeth aren't bothering her as much in the day, so she is able to nap better? Who knows!! It has several settings....so you are able to somewhat adjust the volume....depending on room size and how much noise you are wanting to drowned out! And last....but not least. My newest favorite thing is this laminator!! I found out about this product through Carissa at 1+1+1=1. 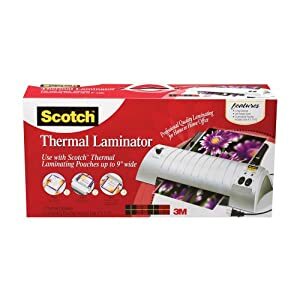 This is the laminator they use. And to be honest.....I bought a big roll of contact paper not that long ago to 'laminate' things that I wanted to be able to keep for a while because I thought it would just be cheaper and easier. Well....Carissa blogged about how right now through July 31......if you buy this laminator (which is about $40) and a box of 50 laminating pouches (about $10).....you get a $20 rebate (I am sure you already know this.....but you do need to keep the packing slip to send in with the rebate form....so don't throw it away, ok? Not that I did this....I'm just saying.). So, basically.....you'd get all of this for $30.00! And this product is eligible for FREE SuperSaver shipping! I used this for the first time tonight and love it. Instead of printing out the stuff I wanted to keep for a while on cardstock....I am now just using regular paper, then laminating. I have been using up the contact paper before I started using the laminator because I did not want it to go to waste.....but I will tell you....the laminating is so much nicer....sturdier.....clearer (more see-through).....and easier to cut than the contact paper. And so I figure....since Parker is just now 2.....and I have another little one (Grace) to think about down the road.....and how much time I spend printing and cutting and planning.....and the many more years that I will be 'teaching' the alphabet......then I want my stuff to keep for a while! And this is the perfect solution! I hope some of these products will help you out as much as they have helped me! How random- I was cutting out an activity for John tonight and told my husband I wish I had a laminator at home! :)One good thing about being a working mom was having access to my school's laminator...I will miss that now that I am staying home. I may have to look into getting one while it is on sale! I will definitely be checking out the laminator! We need to make some photo books of family and seasonal holidays for Audrey. One of her therapist suggested making little books to get her language development to expand. You can also get the razzberry at buybuy baby. I don't know if there is one near you, but the one I go to is buy the galleria!